The big news is that the NFL Los Angeles has emerged as a contender to once again host the Super Bowl --- if it happens it would be in 2020 providing a franchise is in LA by the beginning of the 2018 season and a new stadium built. The City of Angeles has hosted seven Super Bowls. Five have been played at the Rose Bowl and two at the Los Angeles Memorial Coliseum, including Super Bowl I in 1967. The scenario is just a bit reminiscent of details I dealt with in writing my newest sports epic - -WHEN IT WAS JUST A GAME: REMEMBERING THE FIRST SUPER BOWL. That first (and second game) was officially known as the AFL-NFL World Championship Game although from the start fans and media called it Super Bowl. 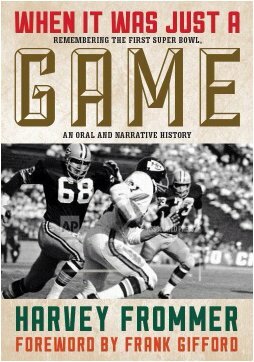 The ultimate game was the result of the merger in June 1966 of the upstart AFL and the establishment NFL. The creation of this game of games was one of the provisions of the merger. The Los Angeles Coliseum was finally selected as the site for the main event. Ground for the impressive and gigantic Coliseum had been broken on December 21, 1921. Designed originally as a memorial to World War I veterans, built at a cost of $954,873, it opened May 1, 1923 on 18 acres in the architectural style of art moderne. The Coliseum had a long history of playing host to all manner of events including the 1932 Summer Olympics. In 1967, the USC Trojans first began playing there and have used the facility ever since. After the Dodgers left Brooklyn at the end of the 1957 season, they played at the Coliseum as the Los Angeles Dodgers from 1958 to 1961. Now it was going to be the environment for the football game of all football games. Maximum effort had been expended decorating the field of play. At the 50-yard line, a large brown football capped with a crown of gold was the central motif. The NFL insignia in blue and the AFL in red, were on each side of the football. “Packers” was spelled out in green on a gold background with the NFL insignia on each side of the west end zone. The east zone bore the word “Chiefs” in red on a gold background, the AFL insignia on each side.